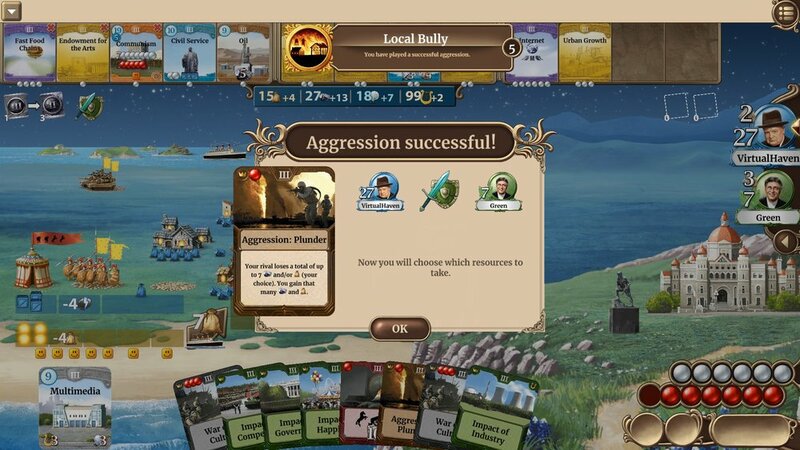 When the meticulous details come into play, Through the Ages shines brightly as a turn-based strategy that comes close to rivaling contending games like Sid Meier’s Civilization. This is a board game that was well-thought-out and refined before coming onto the digital platform. This game isn’t at all simple and takes a few tries to get used to, but as a whole, Through the Ages is fun and addictive. The fast-paced tendency for games to last about thirty minutes is extraordinary for a turn based strategy—TBS. Most TBS games fall into a pit of time consumption, preventing others with time-constraints to play them. With a system similar to a board game, but allowing for quick calculations and providing HUDs that keep track of resources, you can focus on the experience and strategy with relative ease. Through the Ages has a high learning curve, but the tutorial takes this into consideration. It makes sure the player learns each aspect of the game without presenting it in boring cliches. The tutorial shows every nook and cranny, although with the complicated events and resources, it takes some time to get used to. It goes into a tremendous amount of detail by not only telling you about the basics, but also showing you and letting you experience first hand what it is like to build and create a civilization. It's comparable to riding a bike; you need training wheels at first, but with experience, you start to get a handle without even realizing it. One of the best parts of the tutorial is the delivery. The creator of the game explains everything, making for a personal experience. It really feels like you just picked up the board game and someone next to you is explaining it. This human approach makes the adventure more engaging than text explaining buttons. This game places a lot of importance on strategy. Players must use a universal deck through four ages to make their civilization strive. Keeping track of military might, resources, happiness, and culture points is essential for success. Unlike most strategy games where there are multiple ways to win, this game's only focus is to have the most culture points. However, there are several ways to influence culture points, including the use of event cards that grant new land, starting wars, or allowing political negotiations. By building and advancing wonders, there are a plethora of ways to gain culture points, but the strategy comes in how to get there. Incorporating a universal deck that all players can take from makes the game challenging because momentum can quickly shift in another player’s favor. If the player needs an upgrade, but can’t afford it yet, the next player might take it and set the former player back. Foresight is required. Many components affect the outcome, including random cards that can influence culture points at the end of the game based on your technology and resources. Matches last about thirty minutes. Fast paced gameplay coupled with opportunities for antagonistic and beneficial moves make for exciting and unique experiences. The game also picks up in intensity as you progress through the ages. Things become more complicated and difficult in the later stages of the game since more advanced civilizations need additional resources. Through the Ages features custom games for up to four players, an online mode, and a personal in-game account. With potential plans for expansions, it has no limit. Including new cards and decks, new gameplay options to enable more strategies, and even crazier ideas in future updates are simple ways to push the game even further. Although the game lets you choose what kind of civilization to build, there is no story or conquest mode. Two games will almost never be the same, but it becomes a one and done. Even with the numerous variables and quick pace, the game offers no incentive to keep playing other than for fun and achievements. However, the home screen is easy to navigate and allows for different profiles to keep track of win streaks and achievements. For a game that was brought from the tabletop to the digital world, the graphics aren’t the greatest or the worst. Watching your civilization grow feels rewarding and you get to see decently designed buildings. Though they are okay at best, they do not represent the grandeur of the city that is under construction. It is lackluster to see your magnificent creations appear as columns and rows of buildings. 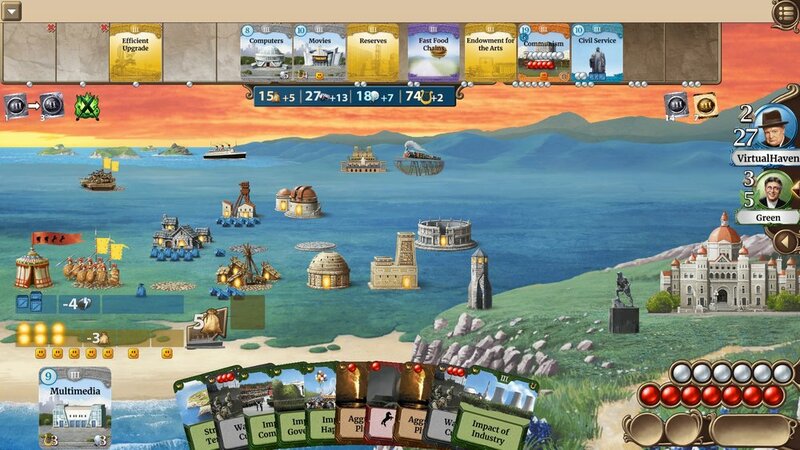 Through the Ages takes a lot into account and delivers a formidable strategy game that is fun and addictive. With so many features and room for improvement, this game can give Civilization a run for its money. Instead of sitting down for many hours with most RTS or TBS games, a quick Through the Ages session is all you need to play to get the full throttle experience a strategy game needs.